The year's most consequential storylines have collided — and are now one mega-story worthy of your undivided attention — with the revelation by Bloomberg's Chris Strohm that "Russia's effort to influence U.S. voters through Facebook and other social media is a 'red-hot' focus of special counsel Robert Mueller's investigation." Why it matters: Mueller's investigation, based on people he's interviewing and questions he's asking, could very well expose in vivid detail not only Russia's influence in the election, and sketchy if not illegal behavior by Trump associates, but also how Facebook, Twitter and social media helped facilitate a lot of it. 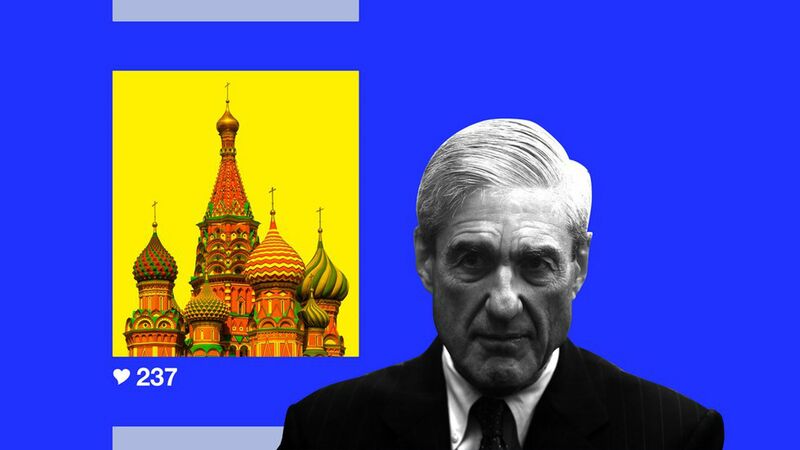 "Mueller's team of prosecutors and FBI agents is zeroing in on how Russia spread fake and damaging information through social media and is seeking additional evidence from companies like Facebook and Twitter about what happened on their networks." "Facebook officials likely to face Congress, key lawmaker says." "Agencies ...are now examining what could be done to prevent similar interference and espionage in ... the 2018 midterm congressional vote." "Russia is ramping up its hacking operations, Director of National Intelligence Dan Coats said." At the same time, Hillary Clinton is out there sounding the alarm with the promotion tour for "What Happened," where she writes that Russian manipulation of the election ("an attack on our democracy by our principal foreign adversary") is "much more serious" than Watergate. "Russia's media and social-media machinery ... contributed to the informational chaos — the fake news and conspiracy theories that coursed through social-media feeds — that characterized the final stretch of the election, to, it turned out, Trump's benefit." "The FBI is investigating two Russian government-funded media organizations that operate in the United States following accusations that they were part of a massive Kremlin operation to help swing" the election. "Russia Today, Moscow's flagship English language television broadcaster, and Sputnik News, a radio and wire service funded by the Kremlin, claim to be legitimate news gathering organizations, no different from the BBC." "But the FBI is exploring whether the two Russian organizations should be required to register as foreign agents ... A U.S. intelligence community report on Moscow's interference in the 2016 presidential race concluded in January that Sputnik and RT ... were part of a multi-faceted Russian intelligence operation." Be smart: The Russia angle will vastly amplify congressional and media scrutiny of the tech giants, increasingly on the defensive for what they know about us and how they have used their power. Per the N.Y. Post: "CNN boss Jeff Zucker slammed ... Facebook at Tina Brown's first Women in the World Canada Summit, saying, 'I urge more folks to hold them to account' for taking ads in a Russian-backed campaign to influence the election." P.S. The N.Y. Times reports that beginning today, the Kremlin is holding "a six-day joint military exercise that is expected to be the biggest display of Russian military power since the end of the Cold War a quarter-century ago." After dinner with President Trump at the White House last night, Chuck Schumer and Nancy Pelosi released a joint statement saying the president had agreed to a legislative replacement for DACA along with border security funding and, crucially, without funding for the wall. The White House released a statement that didn't mention a deal. Trump tweets this morning: "No deal was made last night on DACA. Massive border security would have to be agreed to in exchange for consent. Would be subject to vote. ... The WALL, which is already under construction in the form of new renovation of old and existing fences and walls, will continue to be built." Jonathan Swan's thought bubble: If the Dems are right and Trump plans to enshrine DACA into law without funding the wall, he is risking a revolt from elements in his base. This plan is Jeb Bush/Marco Rubio territory. Sen. Tim Scott, the only African American Republican in the Senate, told President Trump at a highly symbolic Oval Office meeting yesterday that he needs to diversify his staff. Trump "was very much on board with that. Liked that idea and agreed," a source told Jonathan Swan. Scott, who was raised in poverty by a single mother in the South, used his personal story to move Trump, who listened intently. Trump didn't go so far as to admit he made a mistake with his Charlottesville response but said: "I understand." China takes the lead in building quantum networks, per Axios science editor Alison Snyder. (Sign up for her free weekly Axios Science newsletter here — "Subscribe" button in upper right). Networks using quantum keys theoretically allow for very private communications and safe transactions — because if attacked, the key would be altered and the parties would know it wasn't secure. That would be valuable for financial transactions or voting that involves transmitting information between two points." "China built a 2,000-km [1,200-mile] fiber optic network between Beijing and Shanghai and launched a satellite last year — both dedicated to basic research on quantum satellite communications." "[B]eyond a handful of field tests, there hasn't been a commitment to develop the technology at this scale until now." [E]verything is aligned around Apple being the Apple Jobs envisioned: a company that shows its "appreciation to the rest of humanity [by making] something wonderful and put[ting] it out there." By making the best products Apple earns loyal customers willing to pay a premium; loyal customers give Apple both freedom to make large scale changes and also a point of leverage against partners like carriers and developers. And then, the resultant profits lets Apple buy the small companies and do the R&D to create the next set of products. "Our political problems are ... a failure of the nature of the political competition that has been created. This is a systems problem." Trump didn't change this: "[T]he Trump election became a victory for the Republican side of the duopoly — not for new competition." The key sentence: Under Trump, "neither the structure of the politics industry nor its incentives have fundamentally changed." The big picture: "The parties compete on ideology and unrealistic promises, not on action and results." The systems failure: "By nearly every measure, the industry of politics ... is thriving. ... [But p]ublic trust in the federal government is hovering at a near 60-year low." Why it matters: "Politics in America is not a hopeless problem, though it is easy to feel this way ... It is up to us as citizens to recapture our democracy — it will not be self-correcting." Go deeper: See the 75-page study. Be smart: Each side's unresolved splits — Bernie v. Hillary, and Trump v. GOP — signal the possibility that the two uber-parties could splinter further, with dozens of Democrats seeking the 2020 nomination, and populist Republicans empowered while the establishment tries to reassert dominance. For all of Hillary Clinton's skills of survival, she will have a hard time finding a similar peace or place in public affairs [than Gore has]. For one thing, Gore was in his early fifties when he lost. Clinton is sixty-nine. For another, the circumstances surrounding her defeat are immensely more disturbing. Clinton lost a race that few thought possible to lose. 7. "When you're part of the team ... "
On her ability to change her father's policies: "Some people have created unrealistic expectations of what they expect from me. That my presence in and of itself would carry so much weight with my father that he would abandon his core values ... It's not going to happen. To those critics, shy of turning my father into a liberal, I'd be a failure to them." On why she so rarely publicly criticizes her father: "To voice dissent publicly would mean I'm not part of the team. When you're part of a team, you're part of a team." So far she and Jared "haven't felt much of a chill in the liberal New York circles they ran in before the campaign. They know that friends who are happy to trash Ivanka anonymously in newspapers are usually not gutsy enough to do it to her face. "A person familiar with her interactions recalled only one instance where an acquaintance approached her with 'a less than positive response.'" Miami Herald: "Nursing home where 8 died in sweltering heat had poor record with state regulators." "Eight of the nursing home's residents died Wednesday after they fell ill in a building that had been left without air conditioning after Irma blasted South Florida ... The facility is across the street from Memorial Regional Hospital, which never reported losing power during Hurricane Irma." "The National Heart, Lung and Blood Institute recommends that teenagers get between nine and 10 hours of sleep. Most in the United States don't. It's not their fault." "Keith Melton spent 40 years looking for the ice-climbing ax used in the bloody assassination of Russian revolutionary Leon Trotsky." He also has "a mangled, basketball-size chunk of Gary Powers' U2 spy plane shot down over the Soviet Union in 1960. It was a gift from a Soviet official. These and 5,00 other items "are part of the world's largest private collection of spy artifacts. Melton, a wealthy businessman from Boca Raton, Florida, is donating all of it to the International Spy Museum in Washington."